Still, for some of the smoothest Ultra-HD video you can watch - if you can find anything to watch, that is, given 4K's relative infancy - the Roku 4 is a top choice. As a first streaming box purchase or 4K upgrade option it's a great option. Shame it's not out in the UK yet. The Roku 4 is the company's updated flagship set-top box with support for 4K (although, bizarrely, it's still not available in the UK). With so many big-name competitors now on the market, such Amazon Fire TV 4K, is it worth paying $130 for this particular box? See the thing that makes Roku stand-out from its rivals is that it's not trying to sell you its own streaming service. Apple wants you to buy movies or apps from Apple; Amazon's box is basically hardware for Amazon Prime and Instant Video. Roku, on the other hand, is neutral, at least for the most part. Roku openly lets you decide where you want to purchase content from - whether that be through Netflix, Amazon Instant Video, Google Play, or others. So, with Roku, you can get access to not only some of the most popular streaming services out there, including Hulu, but also content from major competitors. That - combined with support for 4K playback - makes the new Roku 4 worth considering. But there could be other reasons why you might choose this box as your go-to media player, especially when getting ready to waste a weekend binging on your favourite TV shows. The Roku 4 looks a bit like a frying pan. Or at least that's what we've been calling it after a friend saw it and laughed about it being so flat and wide that it resembles one. So, the nickname stuck, and now in our house we usually yell: "See if you can rent that movie through the frying pan" or "the frying pan is on input three". 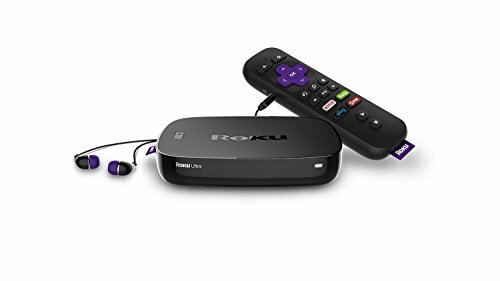 Although its 165mm square footprint and 20mm height looks like what would happen if a semi-truck rolled over Roku 3, the latest model is still very Roku-looking in that it's made of black plastic, has a little purple cloth tag sticking out of it, and features a large "4" stamped on the top. On the rear, you'll find an optical audio port, microSD slot, Ethernet, and HDMI connector. The coolest design element of the frying pan, however, is a button on the top: this handy thing makes your remote emit a sharp beeping sound when pressed. That's right: Roku 4 has a remote finder. Yas! Speaking of the remote, nothing has changed. It looks just like Roku 3's remote, meaning you'll be able to use it to voice search - just like you can with the Amazon Fire TV and Apple TV. Just press the search button, and then speak the name of a movie, director, or actor. But it probably won't work. When we reviewed Roku 3, we thought voice search was pretty decent. But somehow it seems like things have gotten worse since then. It definitely had a hard time understanding us. We searched for numerous things, and it hardly got anything right. Either we have bad diction, or Roku voice search is a bit meh. When voice search works, Roku will display results from all the services and channels you have downloaded. It'll also switch-up the order of results to avoid any bias. Unfortunately, Roku isn't good at contextual searches like Amazon and Apples' boxes, so you can't search for things like "shows with doctors". Beyond voice search, the Roku 4 remote offers directional arrows, the usual control buttons, as well as buttons specifically for Netflix, Amazon, Rdio, and Sling. We can't help but wonder who really uses Rdio that much to need a dedicated button. Roku really should let users program these buttons themselves, but we can see the appeal of quick access ones to the most popular services. Oh, and of course the remote comes with Roku's now-iconic headphone jack and bundled earbuds for private listening. We can definitely imagine it coming in handy late at night when you want to watch TV but still let your household sleep in total silence. Roku 4 is a breeze to setup: plug it in, then create or sign into your Roku account, and start browsing channels to download. Simples. Roku hasn't really changed anything here - despite its new OS 7 software. The interface is still easy to use, and actually seems a bit faster than Roku 3. The interface is dated though. It has a purple and black theme (you can change it) with left- and right-side panes on the home screen. The left displays every section available - including My Feed, Movie Store, TV Store, Search, Streaming Channels, and Settings - while the right pane shows all your downloaded channels. Channels can be things like Netflix, Amazon Instant Video, Sling, or whatever you choose. Roku even offers a section that shows you all the 4K content available from major services. But when we checked it there were only like 100 movies and and 50 shows to watch in Ultra-HD from all providers, including Netflix and Amazon. We browsed movie options in the 4K Ultra HD section supplied by M-Go but didn't find anything too exciting. We also voice-searched for 4K movies, but nada. That goes to show 4K's standing: it's progressing, but there's not a whole bunch of native content just yet. If you're not happy with the results from Roku Channels, you can always access external content by inserting a micro-SD card or USDB drive into the side. It's a solid option for those of you who are torrent hounds (tut tut). You'll likely use the home the most to select from your top-downloaded channels (you can rearrange the order of channels), as well as Search and Streaming Channels for when you want to find stuff to watch or download, respectively. You might also find yourself using Roku's My Feed section. Under My Feed, you will see all the movies or shows you have "followed" (you will see the option to follow something whenever you conduct a search for it). The purpose of this area is to give you updates when a particular movie/show has appeared or is about to disappear or even be discounted on a service. So, if Netflix has just added your favourite TV show, you'll instantly know. But during our short time with this device, we never had a chance to put My Feed to the test. We followed a few things but didn't get any notices. Plus, we found it really annoying that we couldn't follow things within channels. Let's say you we're looking at a show in Hulu. You can't follow it directly from there; you need to search for it and then follow. You can, however, follow things from the iOS or Android apps. These were recently updated with a modern design and the ability to make 4K screensavers. Roku 4 is wider in build because it's packed with more goods, including a faster quad-core processor and support for improved Wi-Fi (802.11ac). It can also stream 4K video at 60 frames per second. The Amazon Fire TV maxes out with 4K at 30fps. But you'll need a 4K TV with a HDCP 2.2-compliant HDMI input to watch 4K from either of those boxes anyway - so be sure to check. Which was our first stumbling block: we don't own a 4K telly at home yet, which obviously dictates the implication of Roku 4's success. However, we got a friend to bring over a compatible TV one Saturday to check out some Ultra High-Definition goodness. And, if you can source the content, it sure does look great. And finally, Roku 4 can play games! But, again, there's only a small selection of titles available. It's an option nonetheless. The remote has motion control, meaning it doubles as a game controller. But if you're looking to really get some gameplay out of your set-top box, we think Amazon Fire TV or the new Apple TV each have more to offer in that department. When it comes to streaming 4K content, the Roku 4 offers one of the most compelling solutions out there - well, out somewhere, as it's not available in the UK just yet. But for those in the US it's an ideal way to watch 4K content, if you have a compatible 4K TV. As an update to Roku 3 that's the main take-away difference (well, that and the remote finder to help stop you losing the little devil down the back of the sofa). So if you don't have a 4K TV then there's nothing extra here for you for that $130 cover price. Sure there are some tweaks to the new OS 7 operation system - but we think it still looks old and boring, especially when compared to the flashy interface of Apple TV or Amazon Fire TV. But keep in mind all these competing media boxes are roughly the same. They play well with multiple services, giving you ample opportunity to waste a weekend binging on your favourite TV shows and movies - but we do prefer the Roku's "equal opportunity" of streaming sources from multiple app locations in the one place - so if you're locked into Amazon's ecosystem (or, to some degree, Apple's), then staying put so that all your kit plays nice might be the easy option until 4K truly kicks off with bags of content. Still, for some of the smoothest (Roku 4 operates up to 60fps in 4K, for whenever there's the content) Ultra-HD video you can watch - if you can find anything to watch, that is, given 4K's relative infancy - the Roku 4 is a top choice. As a first streaming box purchase or 4K upgrade option it's a great option.